Back to July. After a good day walking in the Dartmeet area, Matthew, Jim and I joined Colin and Neil at the Old Inn, in Widecombe. 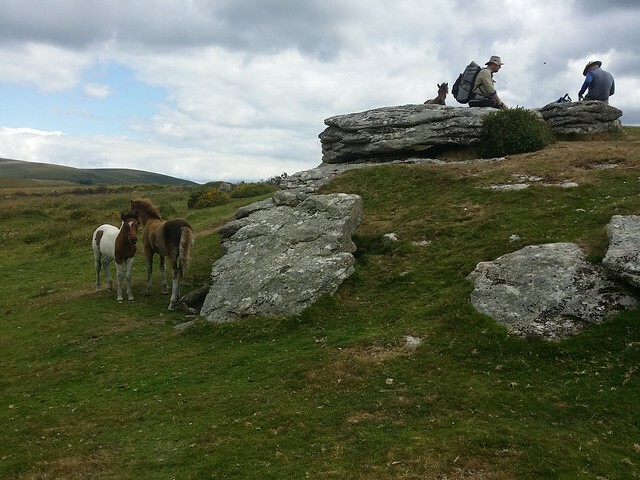 After a quick cider and a purchase of a few takeaway bottles of Dartmoor IPA, we parked up in the security of the pub car park, gathered our gear, then headed off to ascend Hameldown for a wild camp. I'm sure I've mentioned before that my urge to go wild camping has waned. The lure of a comfortable bed back at my home on the edge of the moor is a far greater pull and, quite frankly, it doesn't take much of a reason for me to bail on a night under canvas. Since my long distance adventure on the Bibbulmun Track, back in 2013, I've come to realise that I need a goal to reach, a journey where a wild camp is a means to attain the objective and not the goal itself. Across 52 days on the Bibb, I developed a routine, one I embraced. That routine cannot be replicated on a solitary night in the hills, I am regularly left disappointed. Have I lost my wild camping mojo? I can hardly expect to rekindle affection for something I tolerated more than loved, but still, a part of me does feel that I should make an attempt to see if, at the very least, that tolerance could be restored. This evening I was setting out with a bunch who love a wild camp, perhaps their enthusiasm might rub off! I chose a steep concrete lane via Kingshead Farm, as opposed to the Two Moors Way, as this route took us up to the ridge via Wooder Goyle Rocks. 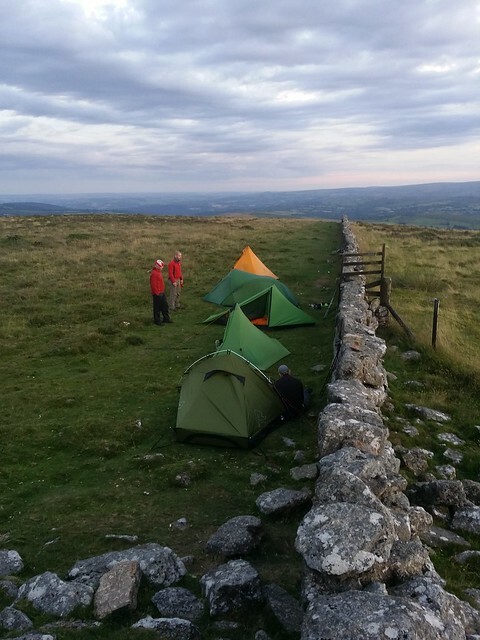 Even if the main purpose was to camp overnight, that didn't mean a few tors couldn't be bagged along the way! With all the bracken it was difficult to get a decent view of this outcrop. Despite my efforts to encourage exploration, that wasn't in the thoughts of my companions and bagging it was deemed sufficient. So we laboured up, through more bracken, followed by an area of bog with some treacherous cracks in the ground underfoot. I was grateful when I spotted a familiar deep trench, a remnant of the tin mining in the area, that would lead us up to the good path on the ridge. For quite some time on the ascent, I was doubting my suggestion to wild camp up here. 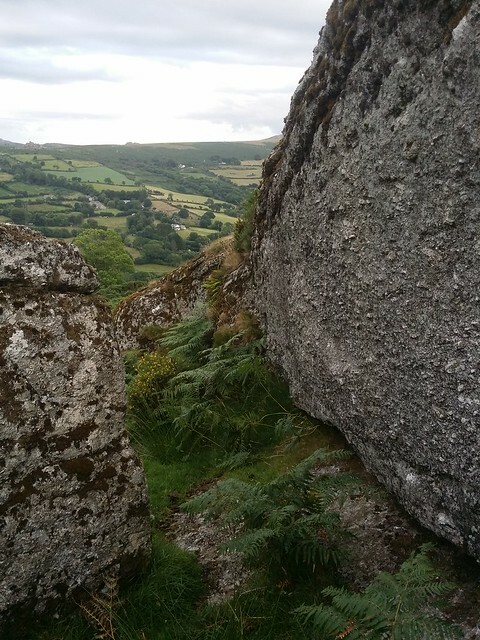 The terrain we had crossed was hardly suitable, but as we approached Hameldown Beacon Rocks, I was pretty pleased with my instincts and we found a great spot in the shelter of a drystone wall. We pitched our tents, opened a couple of beers, ate dinner (or in my case, my uneaten lunch!) and enjoyed the sunset. It was a beautiful display, but it was also a chilly one; I was glad of my gloves as dusk arrived. We weren't long to bed once the sun had disappeared and darkness descended. I left my fly sheet open, facing east for a great vantage point of the sun rise. Sadly it was less spectacular than the show the night before and I took one brief bleary eyed look then turned for a couple more hours sleep. Eventually, the warm rays on my back forced me up and about. Once risen, I'm not one to hang about, a habit of the Bibb kicking in, and I was soon packed and ready to go. A small matter of waiting for the rest to eat breakfast and break camp. 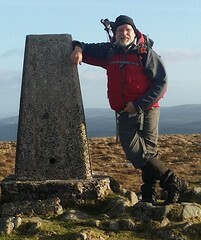 We went north, over Broad Burrow and Hameldown Beacon, as far as the cairn and trig point at Hameldown Tor. 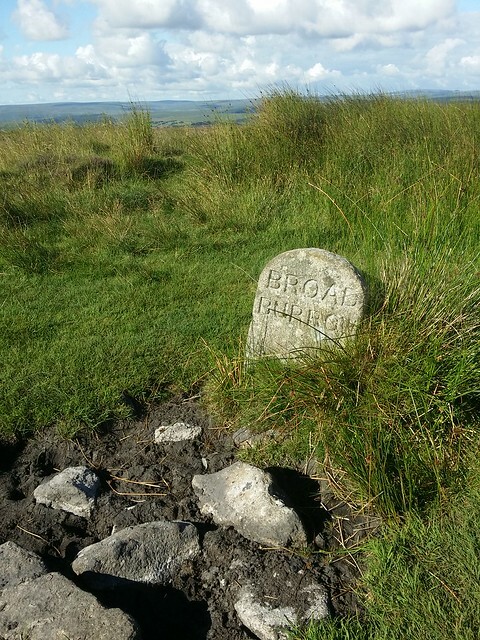 Now was time to return south, back along the ridge, passed our earlier campsite and on the Two Moors Way to Kingshead and Langworthy Tor. We bypassed Old House Rocks on our way, too far off route to the east for today. 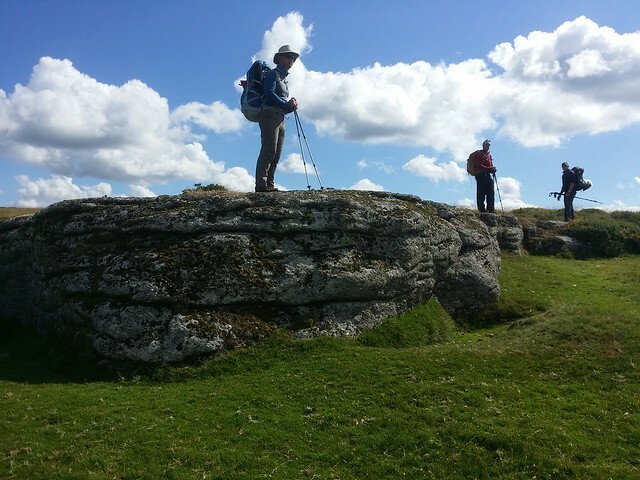 We ticked off Langworthy and I pointed us in the direction of the next; Rowden Tor. At this stage, Colin and Neil had to leave, heading home to Essex. Matthew and Jim got a view of how far Rowden Tor was and decided against it, but having spent a weekend revisiting tors, I was determined to bag a couple of new ones and wasn't going to let this one slip away. It was agreed we would meet up at Wind Tor and I sped off to claim my prize. 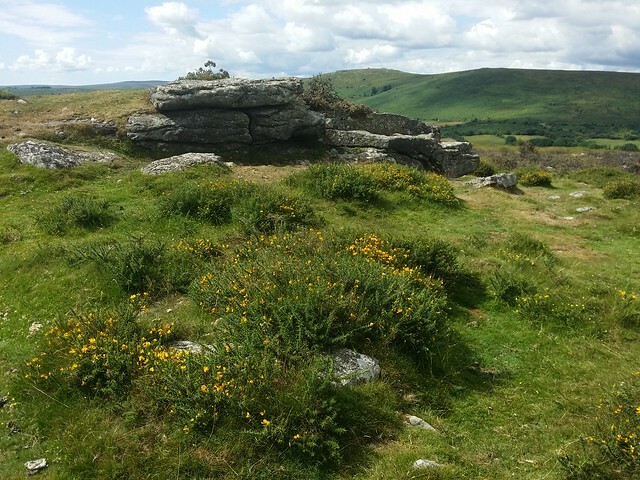 I managed quite a pace to Rowden Tor, a straightforward route down to the road, then up Rowden Down, taking animal tracks that break up the floor of gorse. From the summit, I looked back at Wind Tor and could see Jim and Matthew still approaching its outcrop. My little detour wasn't going to take up much time at all. Rowden is a short outcrop south of the highest point of the down. 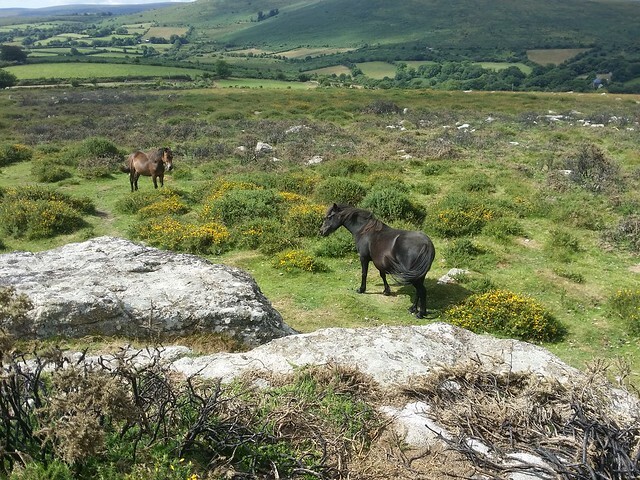 I had a quick look around, careful not to disturb some ponies grazing on the west side, before plotting my route to Wind Tor. 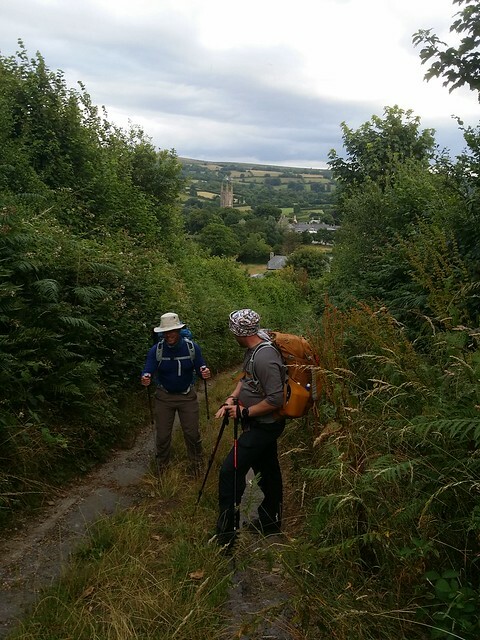 I returned to the road, then took it south east to the crossway where the Two Moors Way splits to give an Exmoor bound walker two options; a high route across Hameldown and Chagford Common, or a foul weather eastern route via Widecombe, where it joins the Mariners Way. Both routes meet up a kilometre east of Fernworthy Reservoir and head into Chagford. I left the road, ascending gradually as I picked my way across the side of the hill. 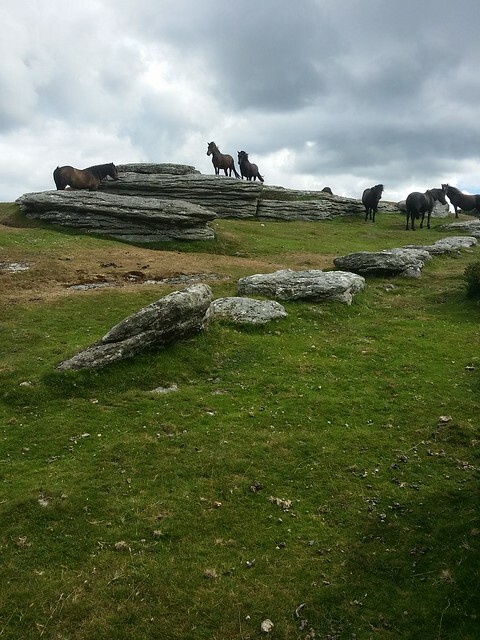 I could see the boys sat on the tor, with their backs to me, surrounded by a string of ponies. Meeting up with them, my little diversion was a mere twenty-five minutes; can't help but think they should have made the effort but I did have a lighter pack. They'll just have to return but let's be honest, the odds are I'll be with them! 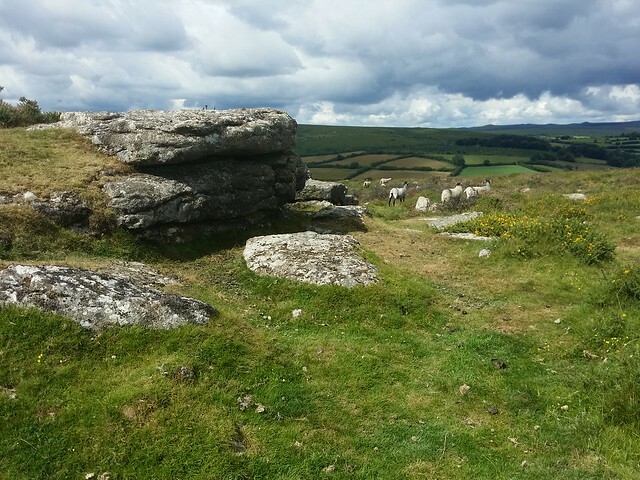 We took the path, from the tor, to the road and followed it down into Widecombe and the car. As we reached the village car park, we spotted Colin and Neil, freshly wet wiped and finishing of a late breakfast by the kiosk. We said our goodbyes again and as they headed home, we set course for the Fox Tor Cafe and lunch. So, summing up my reintroduction to wild camping; I would like to say that I felt some poncy primeval bond with nature, some closer spiritual connection with our neolithic past, or tosh of similar ilk, but I didn't. Sure, the sunset was beautiful, the company good, but it was still a fitful sleep. It had hardly won me over, but it was a more positive experience than negative. At the very least it did convince me to give it another go soon as I imagine that at some point in the future I will embark on another long distance trail, even if it be a week rather than a couple of months, and I should really see it as valuable practice.